The EPI Data Centre Competence Framework© (EPI-DCCF©) provides a reference of 40 competences as required and applied at the data centre workplace, using a common language for competences, skills, knowledge and proficiency levels that can be understood across the industry. The EPI-DCCF© framework enables the data centre operator/owners to map job functions to the required competences for designing and operating a data centre with high-availability and efficiency ensuring that the data centre provides an adequate level of services in line with the business requirements of its customers. 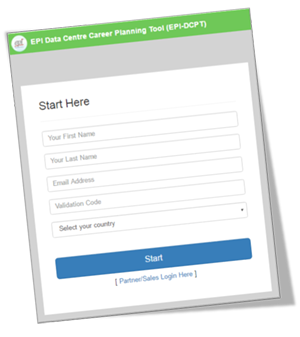 The EPI-DCCF® also provides over 30 samples/examples of job descriptions in a data centre organisation. Download the EPI-DCCF® for full details. For those who want a quick guide on data centre training and career development, the Quick Guide for Data Centre Career Development & Training Roadmap is highly recommended. Extracted from the EPI-DCCF®, it provides the recommended training courses for the different job roles in a data centre organisation. Managers can use this as a template to quickly identify their employees’ training needs and develop their career progression plans. An individual will be able to plan for his/her training to acquire or validate the competences for the current job or for the desired future role.